“A year ago I went to finish my training at the Science and Conservation Center with Dr. Jay Kirkpatrick. I wrote this article on my return. Dr. Jay left this earth three months later and I miss him so very much. He was devoted to humane management for multiple species worldwide, no killing and no capture, but allowing them to live as close to a natural life as man expands globally. He took a lot of flack. 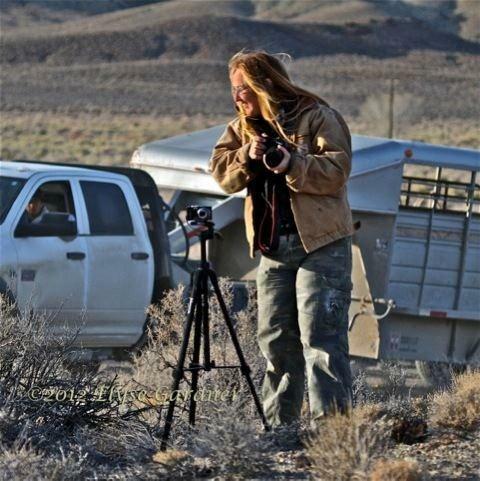 I began an every day mission to gain a humane handling policy and access to capture of wild horses in 2010. There is a bit about that at the bottom of this post. In May of 2013 I was diagnosed with breast cancer and began treatments. I did not stop my on the ground fight but I also began looking for a way to actualize the humane mission on the range, where it maters most. I also began to look for ways to minimize conflicts that distract from making the progress so sorely needed. Being faced with the realization that ‘your days are numbered’ makes you push. I’ve taken a lot of chances and pushed a lot of envelopes. The most frustrating part of this work is that humans appear addicted to conflict, not solutions. They seem to have a need for the chaos and vitriol to increase, not decrease. The drama increases, the threats increase and the obstacles to simply begin to create a ‘fair conversation’ become lost in the people drama. Dr. Jay Kirkpatrick has passed away… my emotions are getting the better of me on too many levels. For now I honor your memory my friend, tomorrow we carry the vision. Advocating for wild horses and burros has many challenges. Learning protocols and policies of various agencies with jurisdiction over management, range health standards, legal mandates and protocols for gaining accountability that include litigation and the real world realities faced by wild horses and burros on public land (and in holding facilities) is a complex and complicated process. Yet one of the greatest challenges is addressing the massive amount of misinformation and prejudice that exists and is continually perpetuated by government agencies, competing interests and advocates that are simply looking to sensationalize issues instead of solve problems. “It’s raining.” That should be a simple statement to make. Yet those that love the rain see you in a positive light while those that dislike the rain may even hate you for saying it. This is the reality of a true wild horse advocate. You simply state a fact and are painted by the opinions others have of that fact, with no appreciation that you have spoken a simple truth. Last week I went to the Science and Conservation Center in Billings, Montana and participate in the Wildlife Contraception certification course given by Jay Kirkpatrick and his staff, to complete my training. We also had the opportunity to discuss several projects I am involved with as well as some of the history of contraception in wildlife populations and dealing with regulatory agencies like the Bureau of Land Management (BLM). This was not my first meeting, nor extensive conversation, with Dr. Kirkpatrick, but it was my first visit to the center. My visit not only provided the certification needed to move multiple projects forward. I experienced a real moment of “sanctuary” myself. Jay is a scientist, plain and simple. Facts are simply facts that are used to analyze a problem within a multitude of factual constraints (legal or otherwise) and science is the tool used to solve problems. Jay speaks my language. If it “is raining, it is simply raining” and conversation continues without being colored by a personal preference to rain. This work has always placed me at the “cross hairs” of intense controversy. When introductions took place in the lobby of the hotel on the first morning Jay laughingly told the others that “controversial” does not begin to describe my work, “She is hated by everyone.” This introduction occurred as I was receiving screen shots of comments being made by livestock interests on the internet that include “Next time we find a rope and a tree and deal with her like we did in 1880.” The next day we watched as extremist activist organizations attacked management practices that include fertility control as they themselves perpetuate fictions as fact. Those “factions” have gone as far as to accuse me of faking breast cancer to gain sympathy and they claim I am a wanted felon (I have walked in federal court more times in the last 6 years than I can even count, if I were on “America’s Most Wanted” I would be in a cell). Fertility control (ZonaStat or PZP) has been used safely in wild horse populations for decades. PZP has been used safely and successfully in wildlife populations of multiple species for decades. It is the only approved vaccine that is reversible that does not interfere with hormonal cycles (behavior). It can be administered without capture or handling. It can stabilize, or reduce, population. It is simply an isolated animal protein not a chemical or synthetic concoction, there is no environmental risk. The above paragraph contains the facts. You can have as many opinions as you want about those facts, yet your opinion does not change the facts. This incredible tool has been available for decades. We are simply not using it to address escalating issues because of opinion. It is not organizations, government agencies or the livestock industry that suffers because we ignore these facts, it is our wild horses and burros. Yes, there are multiple issues in wild horse and burro management that must be addressed. Many of those facts have been outlined by the National Academies of Sciences (NAS) report of 2013. Opinions surrounding those facts are slowing down addressing the issues. There are multiple issues dealing with practices managing other uses of the land that impact wild horse and burro populations and the process to address those is at a snail pace. The fact is that we now have almost 60,000 wild horses in holding, range degradation due to multiple factors is on the rise and wild horses exist in confined spaces, “open range” is sadly another fiction. Simply put, we must begin to address wild horse and burro management from a data based perspective designed to address every unknown variable and slow the growth of the herds to buy the time to address the sluggish pace of public land management. Wild horses must remain on the range if they are to be “integral to the landscape.” The reality they live in must be faced one step at a time. You can continue to operate on debate over opinion. I am preparing, as always, to operate on facts. Jay told me how much he hated roundups and commented that I must have a “stomach of steel.” They make no logical sense and the consequences to the herds, genetically and behavior, were intense. He was extremely excited about the things we were working on, broad areas with strong data collection. He was saddened that so many refuse to look at facts and correct mistakes. The “bash” campaign against his work hurt him as a person. Jay’s work is for humane and sane management, yet he is often not treated with the respect he deserves. I have witnessed more wild horses removed from the range in the last 6 years than any other observer, public or government. I have seen tens of thousands removed by helicopter roundup that disappear into a system of government funded holding facilities with my own eyes. These facilities offer precious few the hope that they will be adopted and go to good homes. The vast majority disappear from public view and land on the tax payer tab. 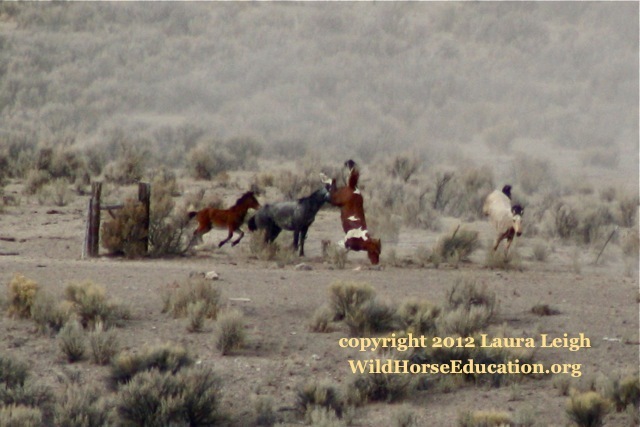 (WHE has the largest single documented record of wild horse removals that exists in the world over the last 6 years. It is not something that anyone should ever document again). I document range conditions and have been working diligently to address escalating issues that have reached a crisis point. Those issues revolve around drought and overgrazing by domestic livestock. The issues of degraded range land are not “blame the horse.” If they were we would have healthy range where we have no wild horses and we do not. The process to address this long standing disease in outdated management is painfully slow. Our wild horses and burros must be managed humanely and integral to the landscape. That statement is a legal fact. Utilizing fertility control as a tool is humane and keeps wild horses on the range and integral to the landscape. ZonaStat is reversible and when utilized in conjunction with a strong, vigorous data collection component is a safe, smart tool to achieve a basis to create real equitable management. Click the image to keep Wild Horse Education in the Fight for our wild horses and burros. Stockpiling wild horses is not management.